Jar mix recipes don’t come much easier than this instant potato soup. 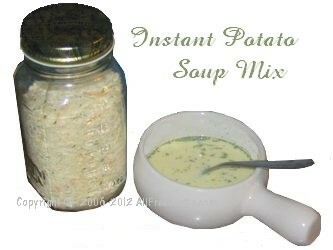 This is a nice jar mix recipe to make for someone who takes lunch to work – all they need do is add a cup of boiling water to enjoy a tasty bowl of potato soup. Combine all ingredients in a bowl and mix. Store in 1 quart jar. Alternatively, you could divide the mix into small ziploc bags, adding 1/2 cup to each bag, as a handy addition to pack with your lunch. Place ½ cup instant soup mix in a soup bowl, cup or mug. Add one cup of boiling water and stir until smooth.